A woman in Kuwait City found it odd when she would come home from work only… and her husband would act surprised to see her. He’d act nervous and antsy, as if he was afraid of getting caught doing something he shouldn’t be doing. According to the Arab Times, the woman suspected her husband was having an affair. Her suspicions grew stronger over the next few weeks, but she had no solid proof. 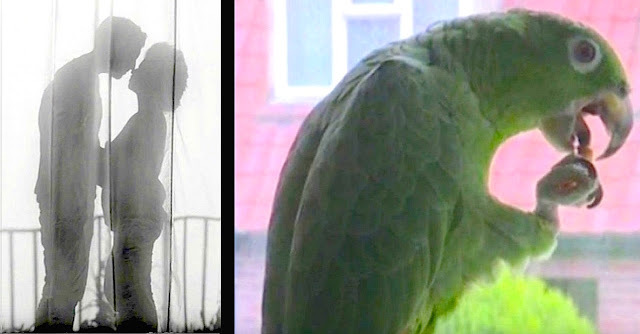 But then the couple’s pet parrot also began acting a bit strange at home, letting out different sounds and verbalizations than he normally did. For weeks, a married woman in Kuwait City suspected her husband was being unfaithful. Whenever she would come home early from work, he would act nervous and skittish. The stranger he behaved, the more she knew something just wasn’t right. The bird began mimicking her cheating husband, from loudly squawking flirtatious dialogue to quietly whispering sweet-nothings. The wife realized her husband never said any of these things to her, which confirmed her suspicions. The wife put two-and-two together and realized her husband was having an affair with their cleaning lady, who would come by the house to “clean” while she was at work. Parrots can mimic human speech, and the African grey parrot can even associate words with their meanings and form simple sentences. The married woman, who remains anonymous, reported her cheating husband to cops. She reportedly used her pet bird’s “claims” as proof. While adultery is illegal in Kuwait City, authorities said the parrot would not hold up in court. This isn’t the first time a pet bird has tattle-tailed. In 2006, an African grey parrot named Ziggy revealed to his owner Chris that his girlfriend was cheating. According to NBC, Ziggy would squawk, “I love you, Gary!” — revealing the name of her secret lover. The talkative bird would also make kissing sounds whenever the name Gary was mentioned on TV! When Chris confronted his girlfriend about it, she admitted to having an affair with her co-worker, Gary. That night, she moved out and the couple split.